Our Children and Families Service provides practical advice, guidance and support to families from the moment a child is diagnosed, through each key stage of their development up until the age of 19. Our Vision is a world where children who are blind and partially sighted are able to realise their aspirations, achieve their maximum potential and reach their goals. Family Support – Immediate and ongoing specialist advice and information over the telephone or in the home. 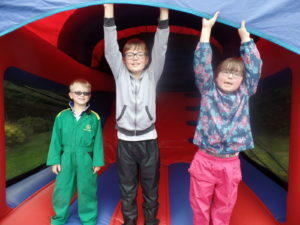 Family / young people’s events – we organise “taster” days with local clubs and providers within a supported inclusive environment. We also organise excursions and social events for our younger visually impaired members and their families to come together and have fun! Advocacy Support – expert advice and representation from both local and national organisations. Sports and Leisure – practical advice and guidance about the availability of leisure services and activities in the county. July followed by fun at the park in August (fingers crossed for hot weather). • Thursday 26th July Sledging at Snozone, Milton Keynes. • Wednesday 29th August Family Fun Day at Wicksteed Park, Kettering.